Treasure Map - Make a treasure style map that will lead guests to the party. Make a map to the birthday party location and draw a large blue circle around the party site on the map. Place two star stickers on the map and let guests know it is the second star from the right. Make the invitations look old by dipping them in brewed tea. You can burn the edges of the paper to make it look older or tear the edges of the paper off before you place it in the tea. Peter Pan Cards - Buy plain green note cards and cut the bottoms of the card in zig zag shapes \/\/\/\/\/ to look like the bottom of Peter Pan's tunic. Attach a red feather to the top of the card with hot glue. Decorate with white helium balloons on the mailbox (clouds) and hang stars from the tree branches and the doorway. Place a sign outside that says "Welcome to Neverland". Hide away by using light and dark green streamers and helium balloons. Cover the Peter Pan party table with a brown or green table cloth and decorate with artificial vines, old fashioned lanterns and large flowers for a woodsy feel. Cover playhouses or swing sets with tarps and/or green and brown streamers to make a hide out. Set up an Indian village with a Teepee and "fire" (make a fire out of cardboard flames and logs). Bounce house - Try to find one that is shaped like a fort or pirate ship. Green t-shirts - cut the sleeves and the bottom in a zig zag pattern - tie with rope or twine. Green pillowcases by cutting a hole for their head and arms. Cut a VVV pattern at the bottom then tie with a rope or twine around their waist. Felt or Material by cutting a long rectangle of fabric (1.5 feet x 4 - 5 feet), then folding the material in half and cutting a hole for the head in the center of the fold. Cut a large zig zag pattern \/\/\/\/ at the bottom. Slip over the kids heads and tie with rope or twine. Make Cardboard Swords - Before the party cut out sword shapes from heavy cardboard. During the party let the guests cover the swords with aluminum foil and decorate with jewel stickers. 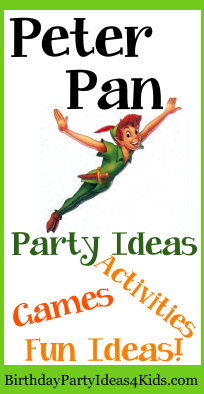 Give each party guest their own tunic (see above for easy directions), foam sword and green hat with a red feather attached (make it modern by gluing a red feather to a green baseball cap). Captain Hook's Treasure Hunt - Set up a treasure hunt for the guests to find Captain Hook's treasure. 1. Fill a pirate's chest with treasures (gold chocolate coins, candies and small toys) either to where the children can separate the treasure when they find it, or in separate bags or pouches with each child's name on it. See our Treasure Hunt page for set up directions. 2. Hide plastic gold coins everywhere. Tell the guests to find Captain Hook's treasure and bring it back for a reward. Whoever finds the most treasure gets a larger prize then the other players. Kids are blindfolded and then asked to "walk the plank" - there are several ways to set up the "plank". The easiest is to draw a "plank" on the ground with sidewalk chalk about 1 foot x 7 feet. Guests have to walk the plank without stepping out of the lines. A real board can be used for the plank - set it on the ground or elevate it with a few bricks. The board can also be placed over a plastic pool (place bricks on both sides of the board to raise it up and then put the pool underneath - don't have the board sitting directly on the edge of the pool) and then ask guests to walk the plank to see who doesn't fall in. Let younger children play without the blindfold. This game is played like traditional tag except that to tag someone the "tagger" must step on another players shadow. When they step on a shadow the person who's shadow was tagged becomes "it". Played like traditional tag except "it" is called Captain Hook. Captain Hook tags players and when they are tagged they become members of his crew. The crew and Captain Hook try and tag all the other players. The last person to be tagged becomes the new Captain Hook. Buy a minute timer that has a ticking sound at the store. Gather guests in one area and then have someone set the clock to 1 minute and hide it. The guests have 1 minute to find the ticking clock (crocodile). Give winners small prizes and play several times. Hang a large sheet across a doorway or hallway and place bright lights (flashlights, lamps or lanterns) about 5 feet behind the sheet. Turn off the lights and have the kids go behind the sheet and make shadow shapes. Send them 2 or 3 at a time and see if the adults or other guests can guess who is who. Fill two small plastic pools with sand. In each pool place 40 - 50 pennies then mix them into the sand so they are hidden. Divide party guests into teams. On "go" the first person from each team will run to the pool, dig through the sand and try to find a penny. When they have found a penny they will run back to their line and place it in a container for their team. Set a time limit of 5 - 10 minutes for each round. The team with the most pennies in their container wins a prize. Played like traditional Pin the Tail on the Donkey only using paper "X's" to pin onto a map. Outline a large X on the map so guests will know where to aim. Mermaid Lagoon Fishing Game - This game is fun kids of all ages. Set up a Mermaid lagoon fishing pond and let guests "fish" for prizes. Guests will put their fishing pole (bamboo or wooden pole with string and a clothespin attached) over into the water - then an adult will clip a prize or piece of candy to the clothespin and the guest will pull the line from the water and collect their prize. For the "water" use a large appliance box, hang a sheet across a doorway, or cover a table so that the "fish" (and the person in the water) are hidden from view. Tie a string to a stick and attach a clothespin on the other end of the string. Birthday party guests take turns "casting" the line into the "water". The person in the "water" puts small gifts, favors or candy on the clothespin and then tugs the string to signal that there is a "fish" on the line. Have lots of prizes because they will all want to do this birthday party game again and again. Star shaped food cut out using a star cookie cutter - sandwiches, jello jigglers, brownies, cookies, fruit, etc. Pixie sticks (place on table in fun jars or cups or wrap them with green ribbon. Wrinkle brown paper bags to make them look like a treasure map.